To make it into the large-cap top ten, these companies had to deliver extraordinary TSR—an average of at least 34.7% per year. That’s enough to more than quadruple the value of each dollar invested at the beginning of the period and nearly three times the median TSR of 12.2% of the approximately 2,000 companies in this year’s Value Creators database. This year’s number one large-cap value creator, Regeneron Pharmaceuticals, delivered a TSR of 75.3%, more than six times the median and more than 30 percentage points greater than the TSR of the number two company, Allergan. For the second year in a row, biopharma companies lead the global large-cap ranking, taking four of the ten spots, including the top three. This dominance reflects in part the fact that the large-cap pharma sector was the second-best performer of the 28 industries in our analysis (the mid-cap pharma sector was the best). That industry-wide performance is even more striking when one considers that pharma was at the very bottom of the industry rankings in our study of the five-year period from 2006 through 2010. Why is it so rare for a company to stay on our top-ten list? To become a superior value creator—the kind that wins a place in our top-ten rankings—a company must massively exceed investors’ expectations. We are not talking about beating earnings estimates for a quarter or two. We are talking about delivering results that fundamentally transform the trajectory of the business. This year’s number one large-cap value creator, Regeneron, is a classic example. Regeneron is a drug discovery business in the midst of what appears to be a vertiginous takeoff, thanks to its distinctive technique of placing segments of human DNA in mice and using the genetically engineered animals as a platform for the rapid (and, therefore, relatively cheap) development of medications that work in humans. During the period from 2011 through 2015, Regeneron achieved a major breakthrough. Previously, the company had been regularly showing negative accounting earnings as it ploughed nearly half its operating income back into R&D. For example, it reported a loss of $222 million in 2011. But since the introduction that year of its first blockbuster drug, Eylea (a treatment for the most common causes of adult blindness), the company’s revenue has grown rapidly, and net profit in 2015 was $680 million. The strength of Regeneron’s drug discovery pipeline has led investors to push the company’s stock price to nearly 60 times expected 2016 earnings, an extraordinary valuation multiple. It is in the nature of capital markets, however, to look forward and to continually capitalize expected future earnings in today’s stock price. As a result, top-performing companies tend to “fade” to average market performance over time. According to consensus estimates, Regeneron should roughly double its earnings by 2018. But if the company’s current stock price already reflects those expectations, then it would grow only at the rate of the risk-adjusted cost of capital for a company of its type (roughly 10%), causing the company’s P/E multiple to decline by about a third. 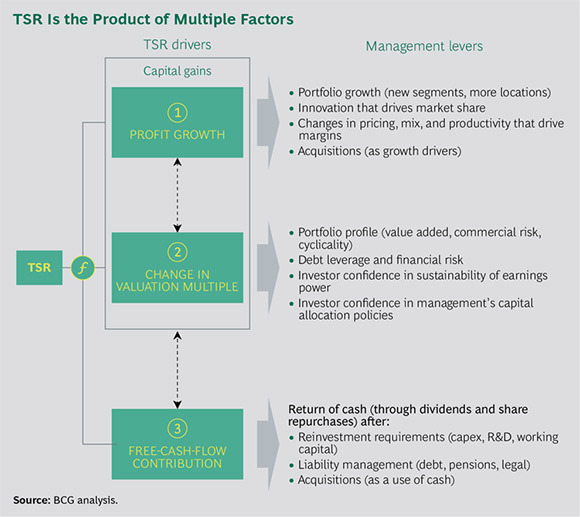 Unless Regeneron can find ways to exceed, not just meet, investors’ expectations once again or to build new expectations for a subsequent wave of value creation, it will be extremely challenging to deliver the kind of TSR it has during the past five years. It’s not impossible for a company to “beat the fade” to average performance, but it is a complex act that is difficult to sustain. Apple is the exception that proves the rule. A decade of product and business model innovation that brought the world the iPod, the iTunes online music service, the iPhone, and the iPad transformed Apple from a niche player in the low-growth and low-margin computer business into a consumer electronics juggernaut, putting the company at the center of a market approximately 30 times the size of its original market and fueling a decade of exceptional TSR. But now that Apple’s market capitalization is more than $500 billion, the company faces the difficult challenge of finding new areas of growth that can sustain its TSR trajectory. Current top-ten performer Tencent, which has increased its market valuation from about $39 billion to $183 billion in the six years it has enjoyed top-ten status, may face a similar predicament.